Can Ms. Hayes go to Washington? Jahana Hayes campaigning outside the recent state Democratic convention. 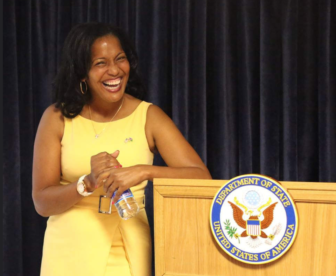 Hayes, the 2016 national teacher of the year, is running for Congress. The history and civics teacher says she hadn’t expected to get into politics. But after more than a year of traveling the country talking to teachers, and continuing to encourage her own students to take on new responsibilities, she said she had an epiphany. Hayes is vying for an open Democratic seat in Connecticut, where she’s taught high school for over a decade in the same school district she grew up attending. She’s been in the race for a drama-filled few weeks: she seemed to have won the party’s endorsement at the state convention before a vote switch turned a narrow victory into a defeat. But she’s still set to compete in the state’s Democratic primary in August, running against another candidate with an extensive education background. And her candidacy comes as teacher strikes across the country have focused new attention on educators in politics. Hayes has won over some institutional support, including the backing of some local unions, and was encouraged to run by U.S. Senator Chris Murphy. 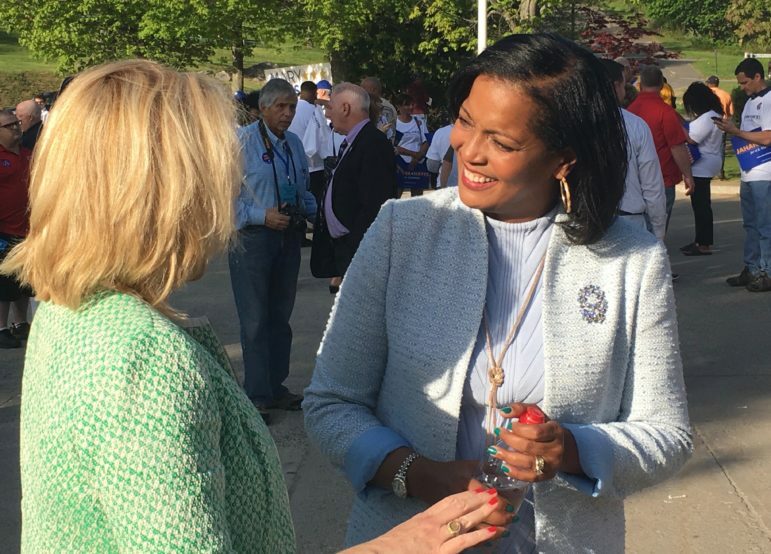 For now, Hayes still works for Waterbury Public Schools, a largely low-income district where she is a talent and professional development supervisor; if she wins, Hayes would be only the second African-American to represent Connecticut in Congress. 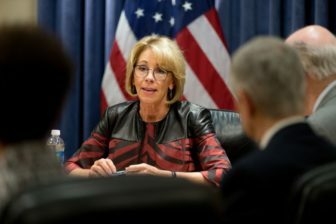 Hayes recently spoke with Chalkbeat, and although she generally avoided offering specific policy proposals, Hayes said she hoped that her knowledge of the classroom could help policymakers — including Betsy DeVos — make smarter decisions. “I need for this president to do well, because if he does well that means we do well,” she said. Chalkbeat: Why are you running for Congress? Hayes: I have always been involved — very civically engaged, registering people to vote, holding forums about the issues, sort of the mule that helps other people get over the line and get elected. When the seat opened up, some of our party leaders approached me and said, you should really think about this. I was like, no way. I started to think of all the reasons why I shouldn’t do it or why I couldn’t do it because I’ve never considered myself a politician. I took a group of kids to California over spring break to build for Habitat for Humanity and I’m saying to myself, you’re telling these kids they can do whatever they want, you can be whatever you want, and here you are checking yourself. I kind of just had an epiphany, like, who’s going to speak for them? I think it was kind of my drive to just do for myself what I’ve done for so many young people. If you’re elected, what substantive things are you hoping to accomplish? One of the first things that I think that me being elected would do is help to expand the definition of what a representative is supposed to be. I’ve had people say to me, “I think that the legislative branch should be composed of people who have a law degree or have political experience.” I have to remind them that’s not a true representation of all people in this district. As far as issues, I think obviously there are so many challenges in education. It pains me to think that public education is in peril right now. I know that I can bring a perspective and knowledge and expertise in that area that is critical. If we start to dismantle public education now, I don’t know how we’ll ever rebuild it. Can you talk about what you mean when you say ‘dismantling public education’? I think that there needs to be a true balance. There’s a lot of talk about moving public money to charter schools and letting the parents decide. Whenever I hear that I’m reminded of the fact that that’s a system that would have excluded me because I didn’t have a parent to do that, to advocate for me. Isn’t a better solution to make all of our schools the best that they can be, so that even absent a parent, if a kid attends a school in this country, they’ll get a high-quality education? I get it, I get it. As a parent, especially in a community like mine, we have schools that have been on the failing list year after year after year. A parent doesn’t want to hear that we’re working on public education and we’ll have it fixed in the next 20 years because they’re worried about their child right now. So I get it, and I recognize that those parents deserve the option to save their child, which is in essence what they believe they’re doing. I think that there’s value in that and they should be given the option, but there has to be a healthy balance, because those options — of having the funding follow kids — really service a small group of kids and leave so many other kids behind. So what is your specific policy view on charters and vouchers? Would you say they should not exist? There is value; those are not very simplistic systems. That also is a response to some of the challenges in public education, but is there the same level of accountability? What happens when kids have specific special needs that need to be addressed? What happens if they’re not successful in those schools? What plans are put in place? We have to make sure that even in that system, people’s human and civil rights are still protected. A better idea than drawing a hard line of demarcation and separating the two is to work together to see what is working about this network. What can we duplicate and filter out into the public education system? Just to totally understand your position: Is there any sort of private school voucher system that you would support, that you would say, ‘This makes sense, let’s try this at some scale’? There is. I have seen some public charters that have been very successful. The process has to be transparent. All kids have to have a fair opportunity for admittance or acceptance. Some of the model that I’ve seen work very well in charters is the parent engagement piece, which has been tremendous. That’s something that the public school system is starving for. I was asking there about vouchers, though, as in vouchers to send a kid to a private school. Do you have a similar position on charters and vouchers or do you see them differently? I see them differently. A charter system can still be public and continue to support the public education system. I think as we increase the number of vouchers that are provided, it takes away from the public school system. I think it’s critical that we have a viable and robust public school system. If changes need to be made for improvement, then we make changes and improve it. One of the cornerstones of this country is the fact that we educate our children. I have to stand for public education. What do you think about Secretary of Education Betsy DeVos? I think that there’s been a lot of missed opportunities. I was teacher of the year doing that transition. I had done a lot of work with the previous Secretary John King. When she came in I was actually excited because I recognized that she had a very different position, but I said, this will be an opportunity to sit at the table and learn from each other. It almost feels like she’s going to avoid anyone who thinks differently than her. This could have been an opportunity to invite public school teachers in, to invite teachers unions, all of these entities, and have some robust and real conversations like, “Help me understand what your concerns are and I’ll tell you why I believe in the system that I believe in,” and then we can come to some healthy consensus. I know she did have some state teachers of the year and spoke to them. Even that, and I’ve said this as teacher of the year, the conversation with teachers can’t just be with the most celebrated teachers in the country. One of the things that when she did the interview with CBS, and she said she hadn’t been into some of the most challenging schools in the country. I think that’s the only way you get a realistic way of what is happening, especially when you’re new to education. Take the time to hear everyone’s perspective. This conversation only happens if it includes teachers who are struggling, teachers who are not being recognized, teachers who are in situations that are detrimental. If you were elected, would you reach out to Secretary DeVos? Would you work with her? Absolutely, absolutely. The only way this works, even with the current administration — I need for this president to do well, because if he does well that means we do well. I need for the secretary of education to be successful because if she’s successful that means kids are thriving. Can you talk to me about your experience as teacher of the year? What did you get out of it, what did you learn, what did you do as teacher of the year? I don’t think everyone actually knows. I traveled the country — I was in almost every state — and what I learned is when you’re in an urban public school and you are faced with so many challenges, you kind of get this idea that you have the monopoly on the problems in public education. But I went to some of the most affluent communities that were struggling with the same challenges. I went to rural communities that had the same challenges. I talked to college presidents, institutions of higher learning, boards, policymakers. It just widened my lens, broadened my scope and helped me to understand that everyone plays an integral role in this process. People do care about what’s happening in the classroom. There were congresspeople and legislators who were fighting just as hard as I was, and I was unaware of the work that they were doing on my behalf and on behalf of other teachers. Can you talk to me about your actual experience as a teacher in the classroom? What were your favorite parts of it, and what were some of the biggest challenges you faced? I loved working in this community because I’m from this community. Kids would say to me, you don’t get it, you don’t understand. They assumed — a lot of our teachers commute in from surrounding towns. I had a student, and I said to her, “You live in the same apartment that I grew up in,” and she was like, “You did not!” Just to provide that level of hope, because many of them don’t see themselves getting out of the situation that they’re in. The other thing that I loved about being a teacher — because I am so connected to this community, I was able to engage families. My students and I, we were known for doing community service, for going into the toughest neighborhoods, and taking a blighted property and cleaning it up, or doing a Habitat for Humanity build right here in this city. What I wanted them to see was you still have the capacity to be a giver, no matter how bad things feel or seem to you. That’s a very non-traditional way to look at teaching, but what I found very quickly was that those two things helped me to be a really good teacher in my classroom because I had a different level of investment. When kids came to my class they wanted to do well. They wanted me to see what they were capable of. And I saw tremendous improvement in so many ways. I became a part of their life in a very different way. I went to college graduations, I went to weddings and birthday parties and cultural festivals around the city because I wanted them to know that their life and what they were experiencing was very important to me. So that’s what I loved about working here. When I was named teacher of the year I had so many people say, oh, now you can go work here or you can go work here. And I was like, you don’t understand. I’m right where I want to be. Can you talk about some of the challenges you faced as teacher or you think other teachers faced, and then segue into what some of the policy solutions that policymakers should be paying attention to help improve schools? It pains me to think that public education is in peril right now. One of our biggest challenges here was obviously parent engagement and the views of parents who are disengaged. One of the things I tried to do in my district was to help them understand we need to look at this differently, maybe we need to be a little bit more proactive, schedule things differently, get out into the communities instead of expecting parents to come to us all the time. Most of our school systems promote post-secondary education. I live in a factory town where most of the families are blue-collar workers; we really have to do more to support those families and children, so really investing in and supporting career-readiness programs and helping to ensure kids have what they need if they choose not to go to college. What has it been like to run for Congress? What has surprised you about the process? I am so pleased with the number of young people who have expressed an interest in being involved in the process. I had hundreds of former students, community members who had previously not been engaged in the process show up at the convention. That for me was great. I entered the race on May 2, the convention was on May 14, and I secured the nomination and then lost it by three points. I thought that was tremendous. The call time, the fundraising, that’s something that is very different for me. I’ve been told I have to raise $2 to 3 million to be viable for a primary. That in and of itself is a system that would exclude someone like me. You don’t know a lot of millionaires? No! One of the strategies I was told was you need to Rolodex all your friends, and I was like, uh … yeah, I don’t have million-dollar friends, and I don’t think you should have to to represent people. I don’t think most people have million-dollar friends or are part of a million-dollar network. How much time have you been spending raising money? Oh my gosh, probably about four to five hours a day. Literally I’ll get out of work and I’m right on the phone, when I’m in the car I’m on the phone, I’m pulling over to send an email to follow up the phone call. There have been a lot of teachers’ strikes, uprisings, and protests across the country with concerns about school funding and teacher pay in a lot of states. What’s your take on that? Why is it happening? I think that for a longtime teachers, we don’t see ourselves as political people. Even though we operated in the backgrounds, I don’t think we were ever truly involved in the process. I think what’s happening is that many people think that our profession is being threatened. People say it’s for the kids, you come early, you stay late, you do all this for the kids — but there is another narrative playing out, and that is that this is profession that people spent lots of money going to school, getting degrees and certified to do this work. It is a profession and it should be treated as such. I’ve traveled around the country and you have people with postgraduate degrees who are pouring their heart and soul into this profession and can’t support their families. It shouldn’t look like that. My husband’s a police office and he made double my salary every year. Originally posted May 24, 2018, on Chalkbeat, a nonprofit news site covering educational change in public schools.